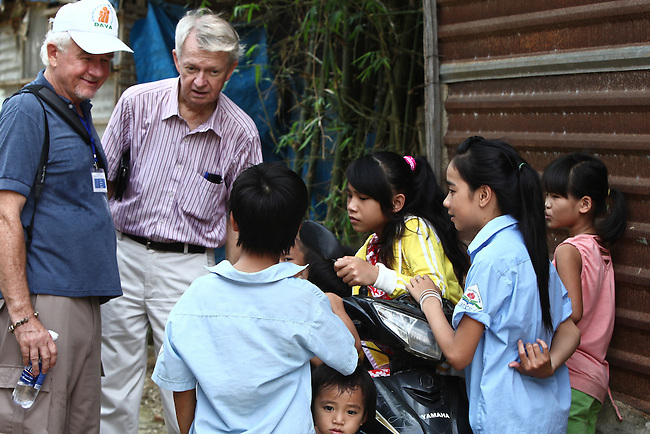 Manus Campbell and Chuck Searcy of Veterans for Peace talk to children in a neighborhood in Hue, Vietnam. The group toured Vietnam in April to learn about efforts to mitigate the suffering of victims of Agent Orange and unexploded ordnance, two problems that still persist nearly four decades after the Vietnam war ended. April 22, 2013.